Above Lismore in the Mountain & Moorland youngstock class, Welsh Western Nationals September 2006. 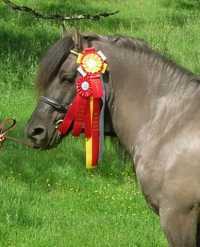 Below Quartz wins reserve champion Mountain & Moorland, West Coast Welsh show April 2006. Weekend workshops: "Herbs for Health and Well-being" with instructor Hope Rose Wright. Includes meals and accommodation at Lone Tree Farm. Workshop can be arranged for 4 to 7 people, reserve your dates early to avoid disappointment! Click here for weekend workshop details. All Year: Vacation farmstays and tutorials. Farmstay prices range from $15/night for basic camping to $275/night for a private cabin, meals in the farmhouse, and 4 hours tutorial during the day. Regular tutorials are available in all the following topics (if you don't see what you're looking for on this list just ask--we can arrange guest tutors to teach additional topics): French Intensive style gardening, market gardening, composting and soil fertility, organic plant propagation and nursery techniques, cut flower production, flower arranging, wreath making, preserving the harvest (canning, drying, juicing etc. ), cooking from the garden, bread making, basic care and training of horses, small scale poultry production, making herbal salves, tinctures, and soaps, alternative energy systems design and installation, drawing and painting from nature, dry-brush watercolor technique, beginning through advanced instruction on the Highland bagpipe (light music and pibroch) and more. August 12-14: Highland Pony Exhibition with Lone Tree Farm Highland ponies and Moonshine Glen Highland Ponies at the Nevada County Fair in Grass Valley. Click here for photos. Pony Camp: The week long August pony camp for children proved very popular! Mountain View Stables will continue offering weekend pony camps througout the school year. Wendy and the Lone Tree Farm ponies will be there helping teach riding and horsemanship skills. 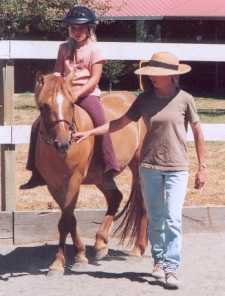 Call Brenda Stone at 707-895-2852 for more information about the pony camp. Click here for more pony camp photos. © 2000-2013 All rights reserved.